Dr. Thijs Heus is an Assistant Professor in the Department of Physics at Cleveland State University. He received Masters degrees in Physics as well as Meteorology and Physical Oceanography from Utrecht University in the Netherlands. Afterwards, he attended Delft University of Technology in the Netherlands where he was awarded a PhD in Applied Physics. Next, Thijs conducted postdoctoral research with the Department of Climate Services of The Royal Netherlands Meteorological Institute and then at the Hans Ertel Center of the Max Planck Institute for Meteorology. Thijs also worked as Researcher at the Institute of Geophysics and Meteorology at the University of Cologne before accepting his current position at Cleveland State. He has been awarded the Faculty Merit Recognition Award from Cleveland State University, as well as Undergraduate Research Awards for the work of his students. In this interview, Thijs shares more about his life and science. When the weather is nice, you can often find Thijs outdoors running. He also enjoys spending time with his family, cooking, and indulging in the many museums, music venues, sporting events, and restaurants in Cleveland, Ohio. 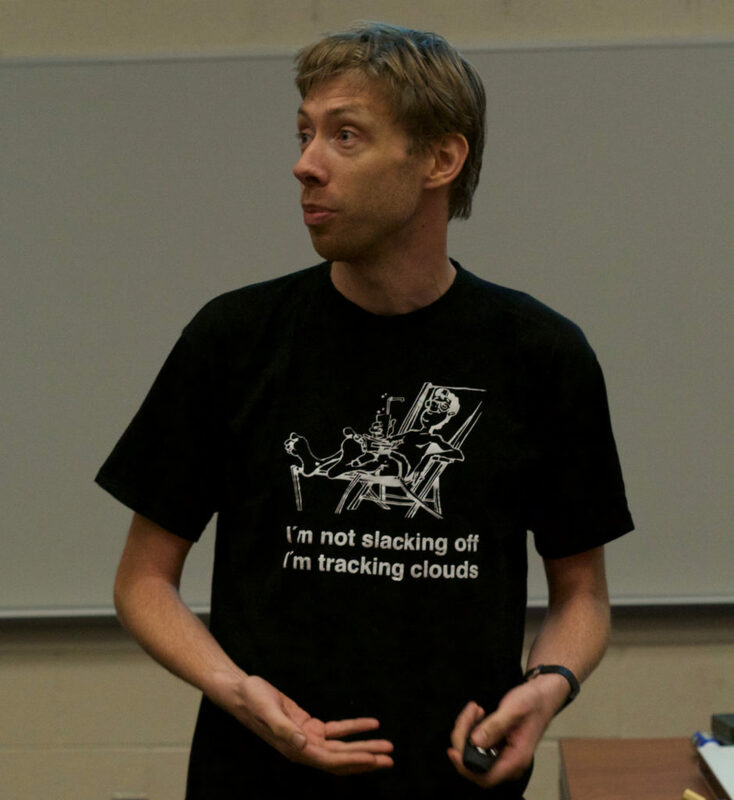 Thijs’s research focuses on clouds and the impact they have on weather and climate. Some of the effects clouds can have include reflecting sunlight (which lowers temperatures) and transporting heat and moisture through the atmosphere. However, clouds remain one of the major sources of uncertainty in climate and weather predictions, partly due to their relatively small size and varying shapes. Thijs uses computer models and simulations to determine, for instance, what happens to clouds when temperatures change, and how the size of clouds impacts weather and climate. When faced with an enormous task, conquer it one small task at a time. In his early years, Thijs was a curious kid who loved to learn. His parents and teachers kept him busy by introducing him to new activities, including studying history, economics, and science. Thijs liked reading about rockets and other topics in the children’s encyclopedias at home, and he conducted his first basic science experiments in elementary school as extracurricular activities. In middle school and high school, Thijs’s interest in physics grew. His high school math teacher encouraged him to pursue a project investigating the color of the sky and light scattering, so Thijs worked with a nearby university to complete his first major research project. Meteorology caught Thijs’s attention in college, and he continued following the next logical steps in his career path while pursuing a variety of exciting research projects in meteorology. Thijs’s first research project in college was a laboratory experimental research project using a water tank to simulate the physics of real-world phenomena. It was a disaster. After flooding the lab more than once, Thijs decided that experimental science wasn’t his forte. While he learned important lessons about being precise, meticulous, and methodical as an experimentalist, computational research was a much better fit. One challenge computational scientists encounter is the many hours spent debugging and figuring out where the code went wrong. Last summer, Thijs was awarded a grant from the Department of Energy to conduct further research on small clouds and to combine this research with observational data. The goal was to use the combined computer model and observational work to better understand the effects of clouds and plug them into climate models. In particular, Thijs is interested in understanding the differences between the effects that small clouds versus big clouds have on their models. In 2008, Thijs attended a summer workshop in Les Houches in the French Alps to learn more about atmospheric science. This two-week intensive program brought together 40 students and postdocs from all over the world to learn from 10 eminent researchers in the field. It was amazing to be sitting, eating, hiking, and discussing science with this wonderful group of people. Beyond shorter trips for conferences and workshops, Thijs has enjoyed living in different cities throughout his career. For example, Hamburg was a fantastic place to live. There were a lot of great places to go running, and the restaurant district was superb. Thijs has also been pleased with the food and culture in Cleveland. The people who work in meteorology and atmospheric physics are exceptional. It is a warm, welcoming, and open group of people. One of the main scientific meetings for their field typically coincides with either the World Cup or the Euro Cup soccer games each year. It’s a lot of fun to watch the matches with people from many different countries, and you can congratulate or commiserate with your colleagues afterwards. If you are nice to people, they will probably be nice to you. Be open, collaborate, and help people out, and you’ll likely have a happier research environment. You never know what great insight or key collaboration could arise from a friendly conversation. Make sure that you have fun in what you are doing in the long term. Try to establish work-life balance, and make sure to celebrate the small victories. Thijs’s research is focused on atmospheric physics, and especially on clouds. Clouds are an important uncertainty in weather and climate predictions, and play a critical role in the reflection of sunlight, in the trapping of heat and in the transport of heat and moisture around our planet. Most recently, Thijs has been working on the distribution of different cloud sizes in a field of cumulus clouds, and how the characteristics of larger clouds differ from the smaller clouds. Outside of work, Thijs enjoys spending time with his wife and young son, running, cooking, and enjoying the culture and nature that the Cleveland area has to offer.